Minecraft is a video game that was first released in November 2011. The building creativity offered players a new experience in the gaming world, and it soon became a top selling product on PCs, Xbox 360, Android and iOS devices. 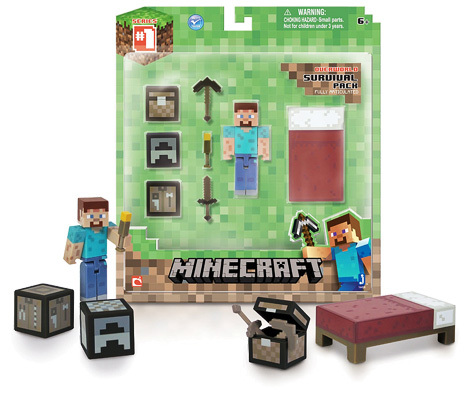 Created by Mojang, the licence opportunities soon became clear, and in the UK Character Options beat off stiff competition to distribute the Jazwares range of Minecraft toys. Launched in Autumn 2013, the ranges consist of a selection of different size action figures, as well as some great plush soft toys. The Paper Craft Collection includes cardboard cut-out pieces that create a series of Minecraft building block pieces. In early 2014 Spin Master unleashed their range of Minecraft toys including a stunning vinyl assortment consisting of Diamond Steve, Pickaxe Steve and the notorious Creeper character. 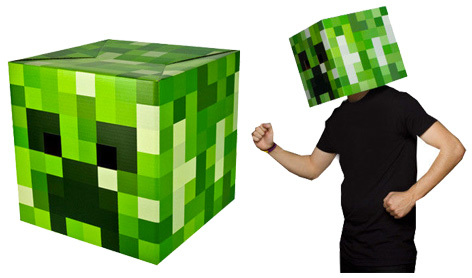 Also popular are the Box Heads which allow children to embark on their very own Minecraft adventure.